Little did I know when I started poking around for women’s bike blogs to read for inspiration where the quest would take me. I knew all the bike blogs in my hometown at the time, and every last one of them was written by a man. Don’t get me wrong—love the guys—but no one was providing a perspective that included issues such as getting your skirt caught on the saddle or dealing with issues of personal safety while riding, let alone biking in high heels or how to find the perfect pair of women’s business pants for bicycling. Fast forward through looking at lots of blogs, following blogroll links, realizing I’d already seen those same blogs linked elsewhere, starting to get systematic just to understand where I’d been, and realizing that I was building an asset that—as far as I could tell—didn’t yet exist. Why keep the good stuff all to yourself? Womenbikeblogs.com and the associated Twitter account @womenbikeblogs and Facebook page /womenbikeblogs were born. “The list” has led me some wonderful places. It became part of my professional credentials as I applied successfully for the position of executive director at the Bicycle Alliance of Washington, the statewide nonprofit bike advocacy, education, and outreach organization. It gave me Twitter buddies across the country and around the world. When I moved to Seattle, where the Bicycle Alliance has its headquarters, I already “knew” some women through our Twitter exchanges. When I took Second Daughter to New York City so she could audition for musical theater college programs the list enabled me to reach out to women I felt I knew; we would have gone riding together if we could have made our schedules work. Ditto for heading to Washington, DC, where I have an invitation to go riding if I can find time. It gave me inspiration and ideas not just for my blogging, but for my bicycling; thank you, @gypsybug/Chasing Mailboxes, for sending me off coffeeneuring and errandonneeing (with a twist). It’s given me insight into types of bicycling I know I’ll never do (like professional mountain-bike racing) and into types of bicycling I dream of doing someday (like traveling on my bike). It led to the opportunity to participate on a social media panel at the 2013 National Bike Summit to talk about the communications value, connections, and sense of community created through the world of blogging. It takes me on journeys I’ve dubbed “blogspeditions”, in which I go surfing through the list looking for blogs that have something in common besides bicycling, whether it’s geography like the recent Australia/New Zealand trip, or a hobby like knitting. Who knows where it will take me next? What kind of list do you think the world needs? Where could your list take you and your blog? 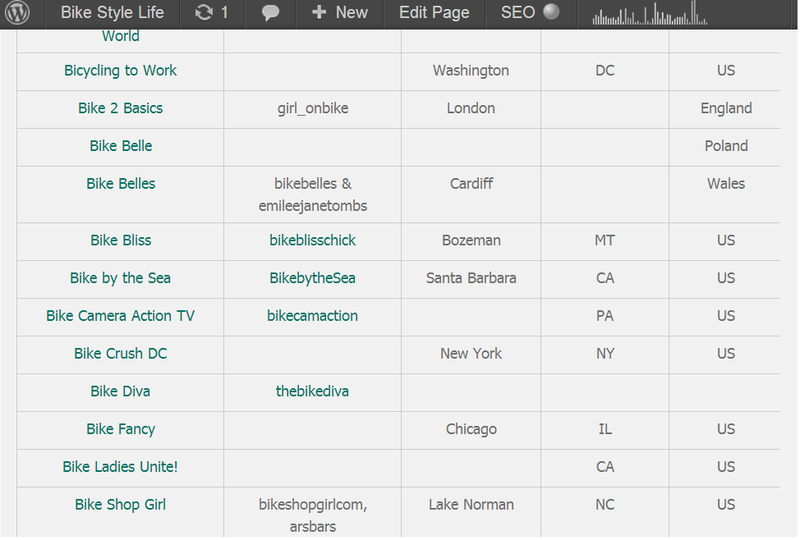 * Speaking of adding to the list, you can add a comment at the bottom of the list page itself, tweet me at @womenbikeblogs, or send an email to womenbikeblogs-at-gmail.com. I catch up with all of those sooner or later (Twitter is fastest). Then every so often I make a clean-up pass to update the list online. Slides from my short talk at the National Bicycle Summit SocialMediaPanel-Blogging_Barb_NatlBikeSummit2013_3-4-13. I doubt others need to repeat the same thing as your mega list of women cyclists’ blogs. I haven’t thought about lists but one thing to me that is important, is connecting with people via my personal blog who aren’t cyclists. Through that we can either share other interests or over time, they might want to join in the fun of cycling. The last thing I wanted to do in blogosphere was use my blog as a public training blog. Who cares about my daily tribulations on becoming fit on the bike? No interest in discussing my personal minutiae on something so hum-drum. It’s not productive use of readers’ time…when they could be out cycling or doing an exercise they love to do! Every blogger is quite individual and so is every reader. Some people might find it inspiring to read the dedicated training of someone who rides and writes every day while others wouldn’t. That’s why it’s so great that there’s so much variety in the list.